Yesterday, we spotted a new bit of documentation on the Google Maps Help site: a page detailing the process to add a public event through the Google Maps Android app. The feature is even live right now, though its behavior is a bit inconsistent in our tests, and isn't present for everyone. The new functionality, when it works, could allow users to submit events akin to the public events being shown in Maps. Maps has heavily relied on crowdsourced information for a while, so adding a means for the public to make a note of public events would be consistent with that approach. Left: New "Add a public event" prompt in the contribute tab. Right: "Spotlight an event" in a new events tab. The new option appears in two locations: in the main "contribute" tab of the "your contributions" section, and in a new "events" tab of the same section. The full public event creation workflow. The workflow to add a public event is straightforward, offering options to name the event, provide a location and time, select from a staggering number of categories, describe it, and provide a website. A handful of character limits are present, but the process is no more difficult than adding an event in Google Calendar. Left: Events as they appear in your events tab. Right: The error screen that appears sometimes when trying to access a created event. While most of the event creation workflow seems to work fine, the end result didn't work for around an hour in our tests. 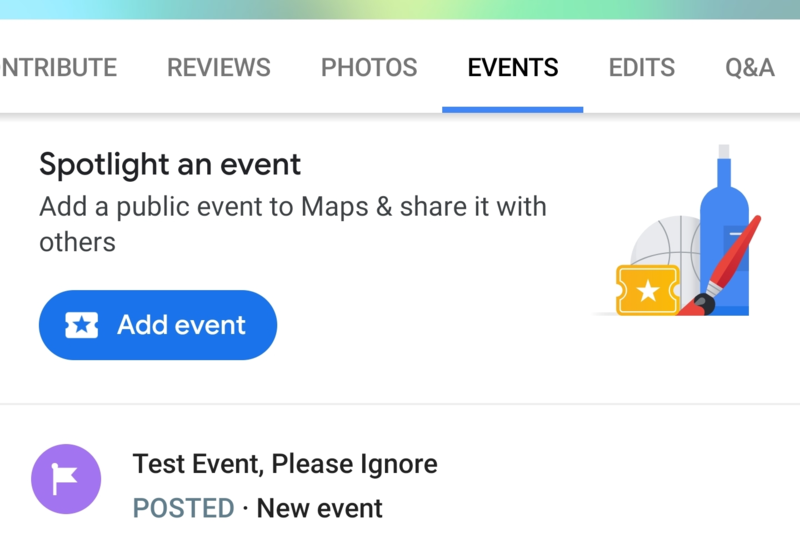 Once you've created and shared a public event, Maps won't actually let you view it for some time, even though the listing for the event appears in your events tab. Instead, you get an error message stating Maps can't access the internet. Furthermore, adding photos to the event outside the header image isn't possible right now — although the dialog to select images behaves as if it works, they are not added. By all appearances, it's still very early days, and it could be that Google rolled out this new functionality and the associated page documentation before it was finished. Whatever the explanation behind its current state, Google looks set to roll out public event creation to Maps soon. It's possible that there could simply be a bit of lag between the event creation process and the page being accessible. For those that have the feature, YMMV. We've updated our coverage with this information.